currently hanging in the dining room. The panels are not the same length and they are too short. He asked why I wanted to do this and I explained that I needed to figure out if the problem was the curtains or the rod...or both. I think helping was against his will as he kept telling me he wanted to watch the news. We measured and the curtains are short and shorter. I was explaining that I thought I'd order the Country Curtains panels because they are a nice price and they have great reviews. He said..."Why don't you just sew some burlap at the bottom of these and call it good?" Then he got excited and told me I should use my sewing machine to sew slip covers for the end chairs out of the curtains. Wouldn't that be a fantastic idea y'all? It would except the sewing machine I got for Christmas is still in the box! I. don't. know. how. to. do. slipcovers! I don't even know how to put thread in the new machine. He has faith in me though. That's why we've been married 25 years. Love HomeGoods prices! Sometimes it seems you could decorate a room there for 20 bucks. Oh, Stacey...I had to laugh! I still have my sewing machine in the box, too! It's been three years and I could not get the hang of threading the bobbin and gave up. Until someone could help me. Which never happened! lol! I think hubby has some good ideas...well intended of course. I love Country Curtains and your new white pieces. Homegoods is an amazing dtore! I love HomeGoods! I am so excited because one is opening about 1/2 hr away from where we live. Can't wait to see what you end up with for your curtains. Like your hubby's idea with the burlap. Great white pieces! That's funny! I once showed a friend how to thread the needle to her new sewing machine and she took off like a rocket after that! I also pointed out to her to please refer back to her instruction manual anytime and for some reason she took comfort in knowing that I still do this often too. :) I showed her how to manually thread the needle which is easier for me then letting the machine thread itself. This helps me to see where the thread goes in and out in case I am having a problem stitching, which usually has to do with not having it threaded correctly. Give it a try! Once you learn a straight stitch you will take off too! Good luck! I totally know what you mean about sewing. I just don't have that gene! LOL! But you might. It helps when you've got somebody who believes in you. :) I say GO FOR IT!!!! That is too funny! Now, the only thing I know how to do with a sewing machine is hem pants. I had to learn since we're all a bunch of shorties. ;) I have no doubt that you'll be sewing up like a storm before you know it! It took me awhile to take my sewing machine out of the box. After that I made burlap curtains and they turned out terrific. I'm sure you will find the same success. Enjoy your sewing machine! I love your new dishes. Love the new white dishes!!! Years ago my MIL gave me a sewing machine for Christmas. It stayed in the box and years later when I donated it to charity it was still in an unopened box. I feel bad I never used it, but I just don't know how/like to sew! *giggles* Mr. Poofing gets cuteness points for sure!!! I think he has a great idea, and I can't sew on a button, so I can't comment about your predicament! Your sewing machine looks nice, and I believe that if there's a will, there's a way. I think you'll be able to learn how to sew and make the slipcovers. You can do it! Of course you can make slipcovers! 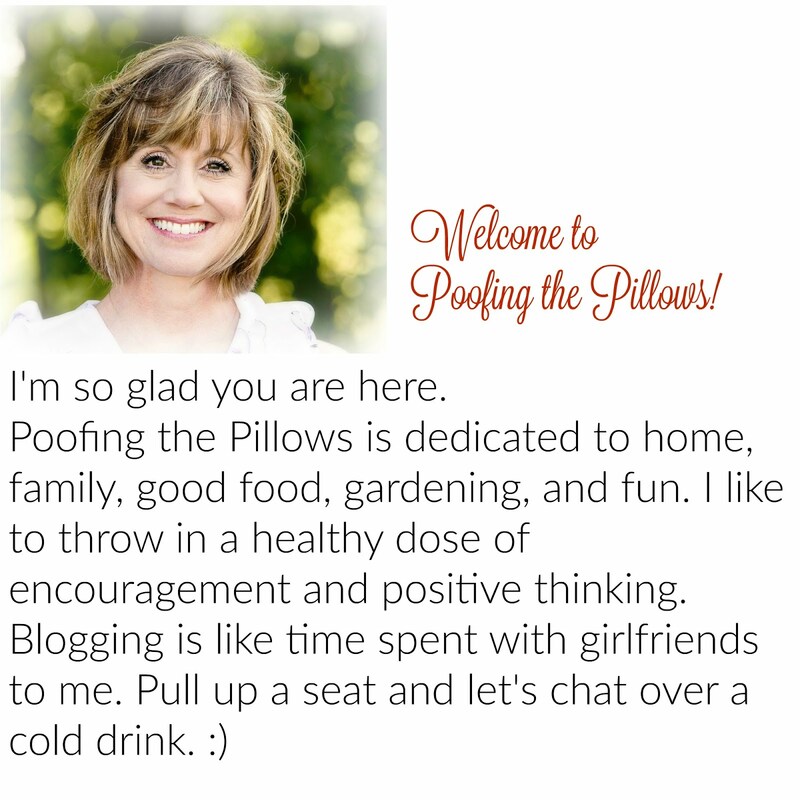 But maybe we should start with pillows first :) I love what you bought at HG! I need to go and see what they have for spring. Did you end up ordering the curtains? Ha! Stacey, your husband cracks me up! I agree, slipcovers are daunting. I had originally planned to slipcover my dining room chairs but re-upholstering seemed easier. Now that I have about a million staples removed I'm not so sure! ugh. Good for you! You found some pretty white dishes! I told you HomeGoods was a great source. Hey, I'm impressed with how much knowledge your husband has about curtains! I don't think my husband would've been that resourceful. LOL! You and I have been married the same amount of time too. Gosh....wait a minute, next month will be our 26th anniversary. I'm already starting to lose count. I don't know how to sew with a machine either. Let me know how it goes. Maybe I'll give it a try if you think it's not too hard. At least you took the first step and got a sewing machine. I still use iron on stitching and fabric glue! Oh my! Some things look so much easier than they are. You can sew? Sew...make some slipcovers!lol And fabric is so expensive, it's even hard to justify making curtains. I hope you figure it out and get what you want. I had a super tiring day and took an early bubble bath! Time to relax! Hey, Stacey! You can do it! I know you can! Sometimes I think learning to thread a new machine is the hardest part of sewing. :) And yes, short and shorter made perfect sense! You can do it, so tear that box open and thread her up! What fantastic ideas. There are some great video tutorials at Miss Mustard Seed's blog. You might try watching those. Very imformative! She uses canvas drop cloth to make many things. Very inexpensive and durable. Have fun with your project! Hi STacey...I nominated you for the Liebster award. Go check out my blog to see what it's all about! How great that your hubs takes an interest in your decorating! And I love his idea of adding burlap at the end! Tell him I think he's a ROCKSTAR!! I can only sew straight lines with my machine. Anything more than that and I get too scared. Sewing a ruffle on a table runner about gave me a heart attack. From one HomeGoods fan to another, I must tell you the white you chose looks so nice. I totally understand the curtain conversation too. I too, think you could learn quickly to sew. It seems it comes easily to gifted people like you. I enjoy seeing all your decorating touches. Beautiful dishes love the sweet little bird on top! If you ever need help with your sewing and getting started I would be more than happy to help you ;0) Good Luck!